!! A Snipers Press Releases Showcase @ The Snipers Homepage : Latest about the Washington Sniper !! We snipers, should get the respect we deserve from the press, but so, would the rest of the society.... We don't get it nor they do !! The problem is that snipers "look" mean and agressive, even their name does so. The word sniper (in english or in the many languajes that have "adopted" the word: russian, yugoslav etc..) or francotirador in spanish (currently called paco , only among the military) is a devilish and politically uncorrect term. 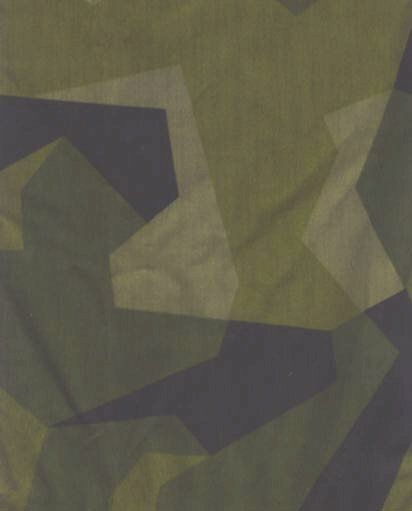 Current agency administrators have done little to show the press the real meaning of a sniper, they have taken the simple way by calling us: select shooters, marksman, surgical shooters etc.... anything but calling us by our name: SNIPERS. We can do a lot to correct that, by showing them how bad or good, the snipers where depicted on the press. By giving them a broader knowledge, they will be able to prepare a GOOD, OBJECTIVE, AND PROFESSIONAL press release that explains our tactical use, our training and what we should be capable to do IF WE ARE ORDERED TO..... TO SAVE LIVES. These are the KEY WORDS, WE TAKE LIVES TO SAVE LIVES. ANY OTHER WAY OF EXPLAINING OUR WORK, WILL END CONFUSING THE PRESS AND PUTTING US IN JEOPARDY. JUDGES AND JURYS TEND TO FORM PERCEPTIONS ABOUT US....ONLY THE TRUTH ABOUT WHAT WE MAY BE ASKED TO DO, WILL SERVE US. Anyway it is very important to KNOW what the press says, so we can reorient them if needed. I am preparing a dossier so that any ACTIVE sniper, that needs it, can get a full report about SNIPERS. That will help a lot when taken to court. PLEASE HELP ME SENDING ALL THE NEWS YOU GET YOUR HANDS ON , BE IT NEWSPAPER PAGES OR VIDEOS. Very good article about Carlos N. Hathcock II, all you need to know about Carlos and a very good article that shows what a SNIPER can do to make your enemy's life miserable. Carlos heroism and the latest developments about his illness and his Silver Star. A french sniper with the Ultima RATIO rifle, see how he exposes his muzzle over the balcony.......NO..NO..., with a non-elevation corrected ZEISS ZM scope . 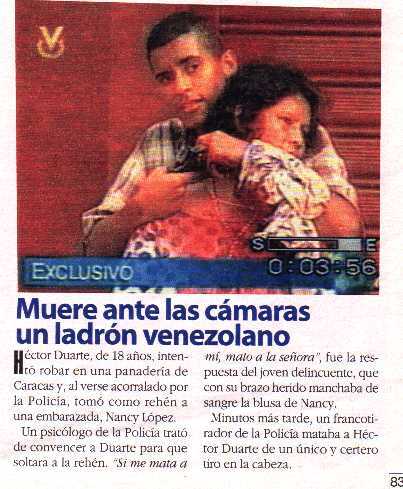 In this little article you can see a last second picture of a Venezuelan hijacker, Hector Duarte 18, exposing his head AND HIS GUN. The sniper got a GREEN LIGHT for a CNS hit.... and solved the life and death situation. If asked for a DISARMING SHOT a carefull sniper should explain the supervisor ( or the sniper supervisor to the agent in charge) all the risks that such a shot have. ONLY CNS HITS CAN SOLVE THIS TYPE OF SITUATIONS, with safety for the victim.